Summer is in full swing. Accordingly, we’ve been filling our gobs with ridiculous amounts of ice cream (in the name of research). These are our picks for Vancouver’s best makers of the stuff, presented alphabetically, on a map and in a poll for your ranking consideration. Happy spooning! Though they specialize in chocolate it should be noted that they also make damn good ice cream, as evidenced by their themed, super fun Ice Cream Socials and outstanding ice cream sandwiches. The focus at this Gastown shop is soft serve ice cream made with organic milk and hit with toppings. Go for the basic twist with honeycomb or coconut with chocolate syrup. The gangbusters success story of the local scoop game, Earnest – first launched in the Fraserhood back in 2010 – has expanded to include three other locations, which we’ve listed below. Secret weapon: sundaes. Dairy-free ice cream? Yup, and it’s fantastic stuff. We’ve been fans since day one. Love the look of the Chinatown shop, too. Wish their were more locations. Flavour: Dark Secret (sour cherries brewed in port wine with chocolate walnuts and quince). La Casa Gelato has been a neighbourhood institution in Strathcona for 35 years, serving up a dizzying array of 238 flavours, everything from gorgonzola and pear to strawberry cheesecake. There’s a good reason why the tiny sidewalk parklet outside Rain or Shine in Kits is always busy. The ice cream is fabulous! They opened a second location on Cambie St. in 2015 (listed below). Best flavour: Coffee Toffee or Honey Lavender. Consistently excellent, decadently dense ice cream made with liquid nitrogen in-house. Mister uses all-natural, mostly locally sourced ingredients, and is a good reason to skip the dessert menu when out for dinner in Yaletown. Hot tip: Smores Bar. Our go-to when looking for something sweet in the Little Mountain neighbourhood. They specialize in gluten-free ice cream cookie sandwiches. Multitude of flavour combos to choose from. Aim for the Butter Cup (chocolate ice cream between the peanut butter cookies). The multiple award-winning, internationally celebrated bell of the gelato ball is famed for its consistent awesomeness across all flavours. The stuff is flawless. Current favourite: Belgian Chocolate Brownie. Brown Paper Packages operates out of tiny Pazzo Chow in Chinatown, offering ice cream sandwiches, scoops, pints, floats, ice cream cakes and ice cream sundaes. Cross your fingers for pineapple sorbetto. Flavours lean to basic at this West Side newcomer, but they’re always done well, and that counts for the vegan and dairy-free options too. Favourites to date include Mint and Salted Caramel. A small liquid nitrogen operation that compliments its mainstay flavours with must-try oddities like Oolong and Sweet Maple Corn. Secret weapon: strawberry milkshakes and lemon cookie ice cream sandwiches. Arguably Vancouver’s most attractive ice cream parlour. They don’t rest on their aesthetic, however, as the French-style product is superb. Next level: ice cream pavlovas! 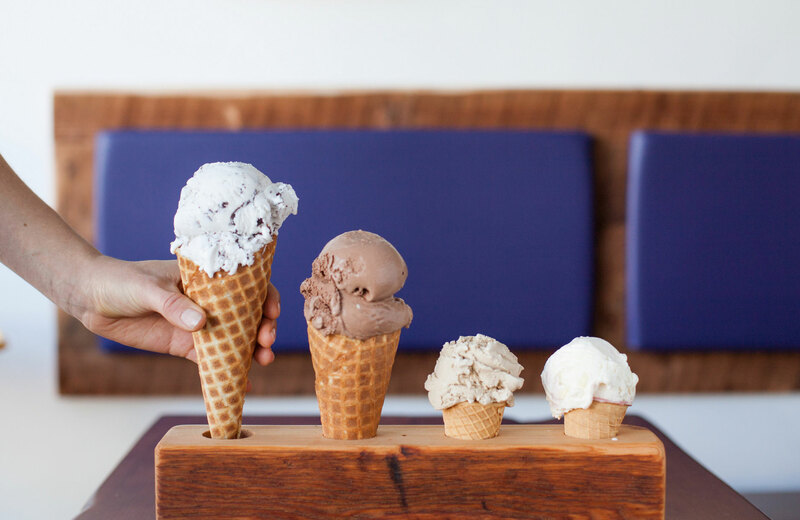 Who makes the best ice cream in Vancouver? Rain or Shine also has a location at UBC (6001 University Boulevard) right next to the bus loop. Where’s Commercial Drive’s Dolce Amore? Perfect texture, fresh natural favours; head and shoulders over everyone on this list. Huh? Are you kidding me? No mention of Amato Gelato Cafe on 1st Ave? It’s the best non-hipster Gelato in the city bar none!!!! Why isn’t Rooster’s Ice Cream Bar on this list? ? I’d vote for Welcome Parlor in North Van, too. Small batch, delicious flavors and natural ingredients. It’s at 8th and St Andrews. Soft peaks are the best! So creamy and not overly sweet organic soft serve. Can’t get enough. Agreeing with sigs, where is Amato? I love Mario’s ice cream, it’s so smooth! Welcome Parlour needs to be on this list!! List can’t be complete without Roosters. No love for Roosters? What the heck? What school did you guys go to? If that list is in alphabetical order then I must be dyslexic! Also I add my vote to all those saying Roosters should be on that list – definitely better than Earnest or Rain or Shine and without the queues. What about Say Hello Sweets? I know it has already been commented, but Welcome Parlour is by far better than any of these! And Roosters (for their amazing lemon poppy seed) ice cream. Also, if you are covering all neighbourhoods, you must also include Rocky Point Ice Cream in Port Moody! And if you want to throw in something new, there is also the newly opened Perverted Ice Cream (haven’t tried it yet but popped my head into the place and it looks super cool).